I enjoy learning from other people. So when I heard someone talk about adopting one word in particular during a season in life, such as a year, which becomes a filter through which one makes decisions or considers opportunities, it intrigued me. For some reason, it really struck my spirit as something I needed to do. Interestingly, the one word I chose popped up in my head right away. I have to admit that I was hoping to adopt a neat, trendy word, but I’m afraid it’s a bit boring. WHAT’S THE POINT OF ONE WORD? From what I understand, it’s to create focus and even move us out of old habits. All of us adopt thinking patterns that take little effort. They are subconscious and we use it as a filter to see what we want to see or make excuses for those things we inwardly want to avoid. It is easy for fear and complacency to take up residency in habitual and comfortable actions and thinking patterns. Adopting one word with which we are committed to filtering everything through forces us to stop the auto-pilot of our thinking. It challenges us to try things we wouldn’t otherwise try. Having a distinct word that governs our actions for a time is somewhat like throwing a stick in the wheel of a bike. Suddenly our customary way of doing things is brought to a halt. Now we notice options we’ve been blind to previously. Perhaps the word you choose will force you to finish that project or go to an event you otherwise would have declined. Every step we take in a different direction outside of our well-worn paths, opens new doors. It also brings our attention to people or projects we have forgotten about. Maybe you’ve been stuck at a certain place for a long time. Adopting one word can be that catalyst that acts as sand on the ice for traction or a rope to pull you out of the mud; or even that little nudge to knock you over the edge. Cause (something) to occur in a particular way. Be the decisive factor in. Ascertain or establish exactly, typically as a result of research or calculation. Picking a word is easy. Applying this great idea….uh, takes some work – and determination! The way I am applying this concept is visually keeping “determination” in front of me throughout the day. Reviewing the definitions is part of my morning routine. I ponder what in my life needs some determination. It’s also easy to see, when I look at the definitions, that there are areas in my life that I tend to be wishy-washy in. I allow fear to second-guess myself. However, determination tells me to make a FIRM decision and stick with it. Now, time to consider what actions I need to take to ensure that I don’t back out or second-guess myself! Personally, I can see how determined is a perfect word for me at this time in my life. There are many ways I need some determination get me unstuck in certain areas of my life. Take a few moments and be quiet. If you pray, ask God to give you a word. Write down the first one that comes to mind. Then take that word, look up the definition, write it all out and share it with someone. It helps to tell someone anytime you are making changes or choices that will potentially disrupt your ingrained patterns and habits. 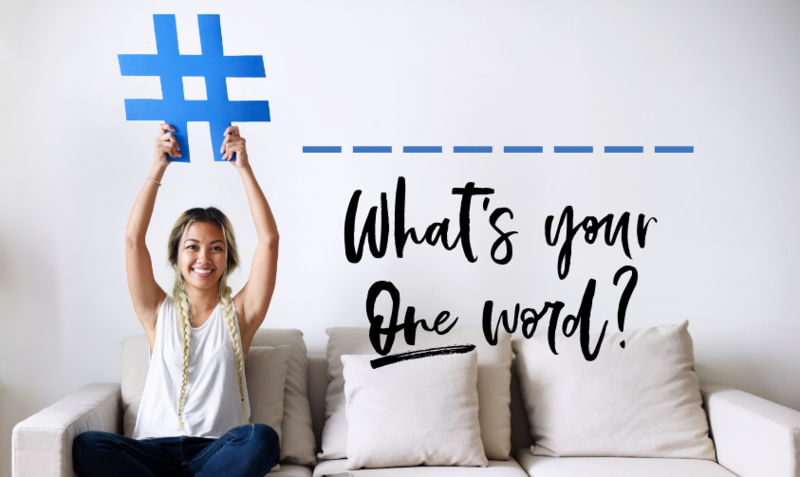 I’d love to hear the word you choose. Share it with me through email or posting it on my Facebook page! Want in on short thoughts and resources I share with my community of entrepreneurs/microbusiness owners? Click here to join the community for free.